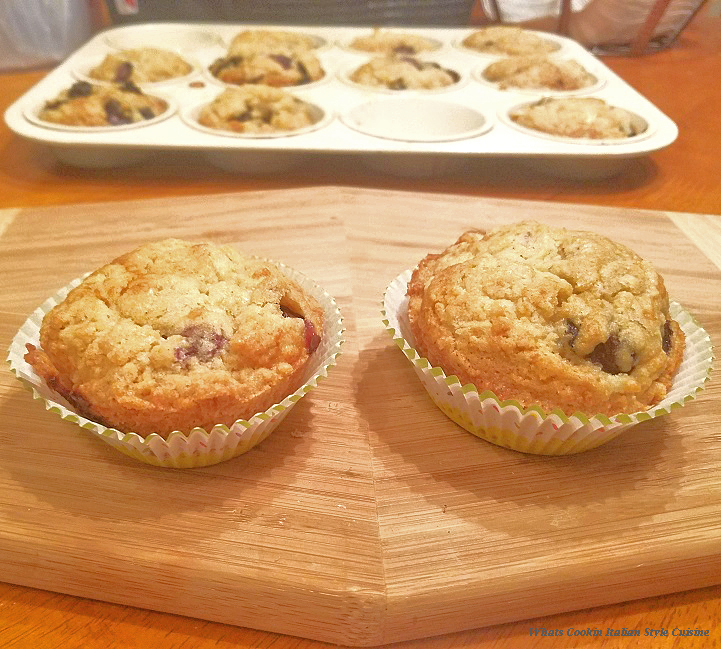 These Apple Blueberry Cinnamon Muffins are the perfect start to anyone's day! The muffin tastes similar to an apple cake, homemade from scratch. The delicious combination of flavors are perfect together and then with a hint of cinnamon add that comforting touch! The cake-like muffins can also be used for a dessert. Add a dollop of whipped cream on top and you have a whole new use, besides a breakfast or brunch muffin. Perfect addition with that first cup of coffee or afternoon tea! I love apples in just about everything and they hold together so well, they are perfect for traveling. The smell as they are baking will certainly have your mouth watering for one. The whole kitchen smells wonderful! I just love quick bread with fruits and this is easy to make and my go-to recipe. It's the best recipe for muffins and so versatile. Add whatever fruits you like. This basic recipe is sure to please everyone that tries them. Making Muffins are so easy! There are so many possibilities when it comes to flavoring muffins. This is a baked muffin with a crispy outside and soft moist inside. I really like the combination of the tartness in the apples and then bringing it together with the sweetness of the blueberries. The two fruits together really do compliment each other. Serve them heated up or grilled with butter in the morning, grilling them just brings them even to a new level of deliciousness. Of course, you know to grease the pan heavily or use paper liners. I do recommend, however, with this recipe to spray instead because of the high sugar content in the recipe, the batter tends to stick to the muffins after baking. Here is a photo below shot with all oil and no applesauce. You can make them either way. Using the cake liners after they are baked is easy to store so they won't stick together. The recipe makes around 12 medium sized pan muffins. I fill them 3/4 full, I like a full muffin after it's baked. I highly recommend doubling the recipe if you want more. Between my husband and my son, they each have two after dinner if I make them during the day. They can be served warm with whipped cream or ice cream because they taste like a delicious cake! Once in a while, I like to add some topping on the muffins. 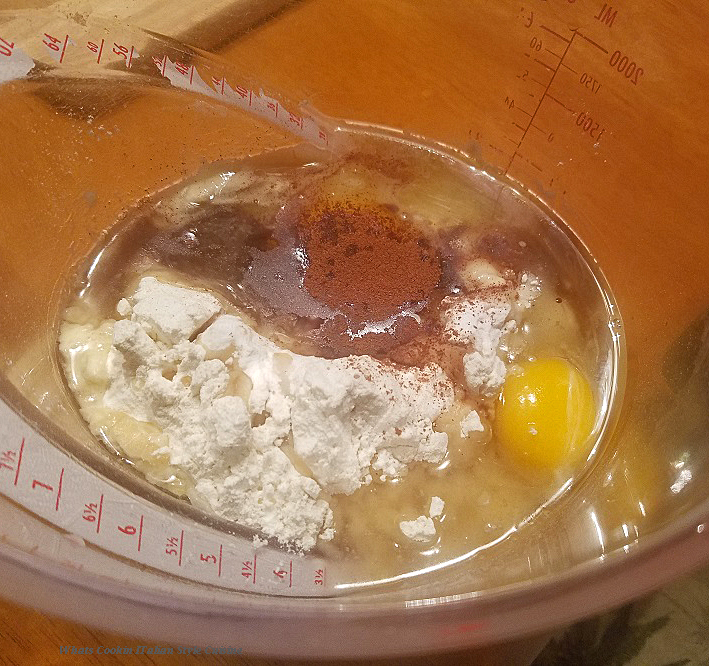 I usually will take some flour around 1/4 cup, 2 tablespoons of softened butter and a pinch of cinnamon and some chopped walnuts and sprinkle this on top before they bake. You can also add shredded coconut or even chopped dried fruits like dried apricots, raisins, cherries or even craisins. Certainly, chocolate chips are always welcome! The rest of the crew here in my house aren't fond of nuts, that's how I know I will get one for sure. Perfect for work and on the go! These muffins are just perfect for on the way to work or school when you're in a hurry. They aren't crumbly at all and perfect for traveling anywhere! I just hate when a muffin crumbles all over the car and doesn't stay together, these are perfect! I really prefer to use all fresh ingredients. Frozen will make the batter mushy and has too much liquid. After you rinse the fruits you use always dry them with a paper towel before adding to the batter. Any kind of fruit goes great! 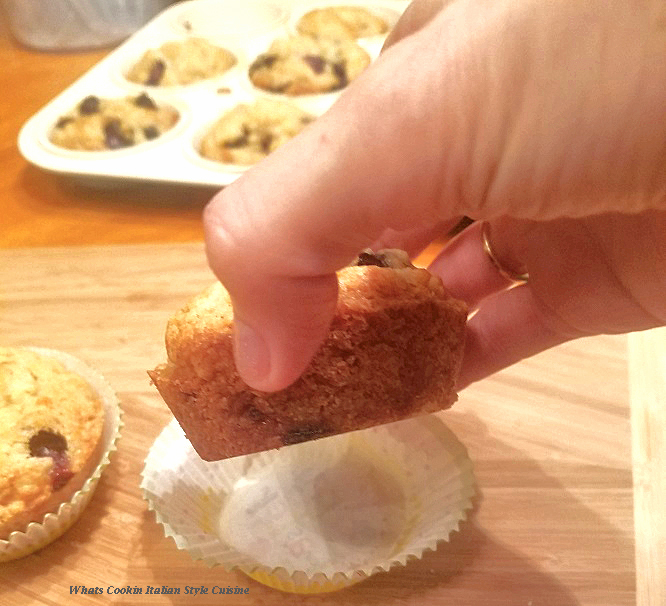 I rarely use the paper cups to put them while baking, but I do like to place the muffins in the paper liners after they are baked, especially for traveling, they just look better. If you know ahead of time you will be traveling, that's a good time to use them to keep them from sticking together when packing them in a container. Just remember if you prefer another kind of fruit, cherry, peach, raisin, pineapple, coconut, chocolate chip, or any other ingredients, just substitute those for the ones in this recipe. Raspberries, strawberries, and blackberries, work great with this recipe along with chopped mango. Easy all in one bowl! I combine all the dry ingredients in a bowl and combine. They add all the wet ingredients and stir by hand until it's evenly blended. Last, just fold in the fruits. You can also cut the sugar down if you like by around 1/4 cup if you aren't fond of sugar. This basic recipe is perfect to me as it is, but I know it may be too sweet for some folks. I have always loved grilled muffins, maybe you saw that post a while back of my post on grilled blueberry muffins. Sometimes I just want something a little sweet with my coffee of tea but not a cookie in the morning. That's providing the rest of the family lets there be any left in the morning! 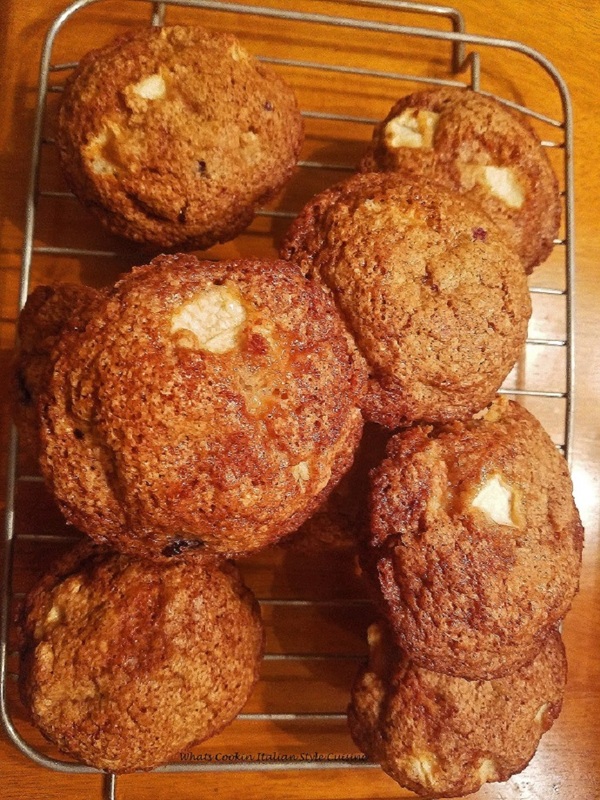 These are cake-like apple blueberry muffin. They are perfect for breakfast and even as a dessert! In a large mixing bowl add the vanilla, egg, oil, sugar, and applesauce. Stir in the cinnamon, baking soda, and salt mixing together. Add the flour and stir till blended. Fold in the fruits. 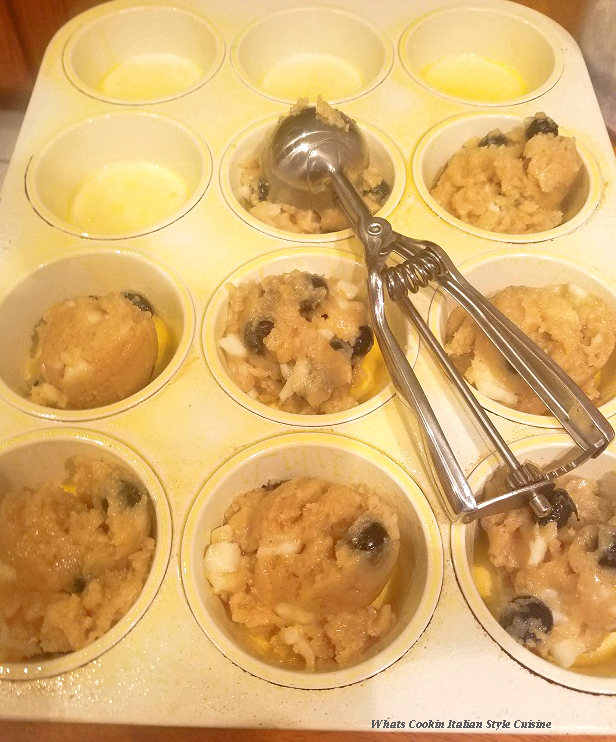 Pour into greased muffin pan and bake on 350 degrees in preheated oven until the middles are set around 25 to 30 minutes. Note: When using high water content fruits, blot dry before adding. Don't forget to try Grilled Muffins! Muffin is my favourite thing to bake! These look fantastic and great for either breakfast or afternoon snack. This is a great recipe - simple and flexible, and looks delicious! Next time I want to make a batch of muffins I'll be coming back to this recipe for sure. Love the flavor combination of apples and blueberries. You must have a secret though that the blueberries aren't peeking out everywhere. When I make blueberry muffins they look blue half the time. A combination of two classic recipes. What a good idea. I'm sure they're perfect with a hot cuppa tea! I love all things apple---and adding blueberries just makes these even better! What a delicious muffin! I actually just tried the apple blueberry combo for the first time, and I love it!! This sounds so good!! I love the convenience of having a batch of muffins waiting in the morning (as long as they make it that long!) These look delicious! 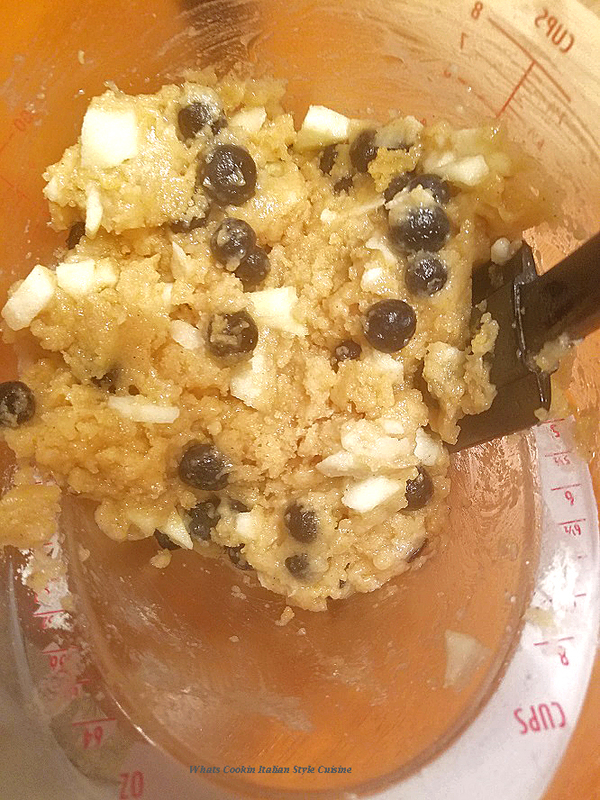 Apples and blueberries sounds like a great combo for muffins. They look great, Claudia! Love the apple, blueberry combo! Like the new look of your blog too! I love adding a little bit of cinnamon to blueberries. I would like to make these for the kids, they would love them! 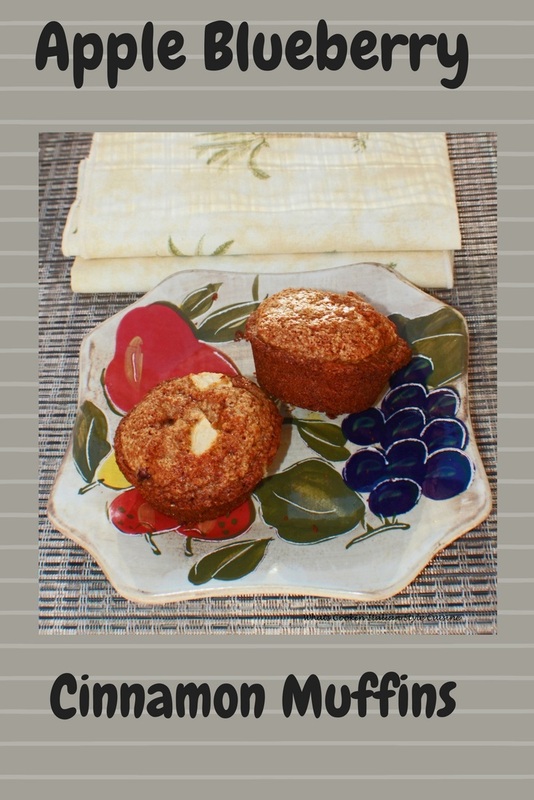 These muffins have 2 of our favorite fruits and we love muffins for breakfast, snack and desserts. The boys are home now and I will bake a batch with them. I just cant wait one more month for blueberries to be in season! Combined with apples and cinnamon they create an amazing muffin combo! Oh my gosh I need to try ASAP! 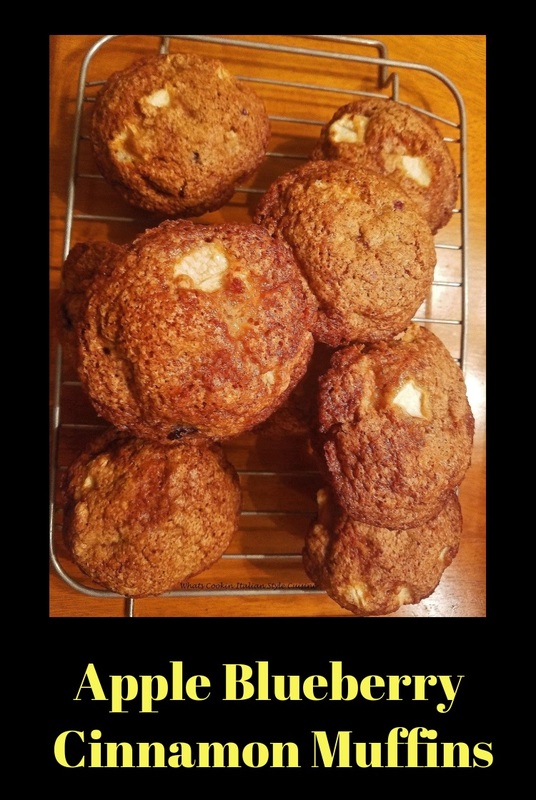 These apple cinnamon muffins look very tasty! I want to eat them for breakfast, lunch and dinner. Its fantastic! Thank you for sharing this great recipe. I'm sure this recipe will be my favorite. 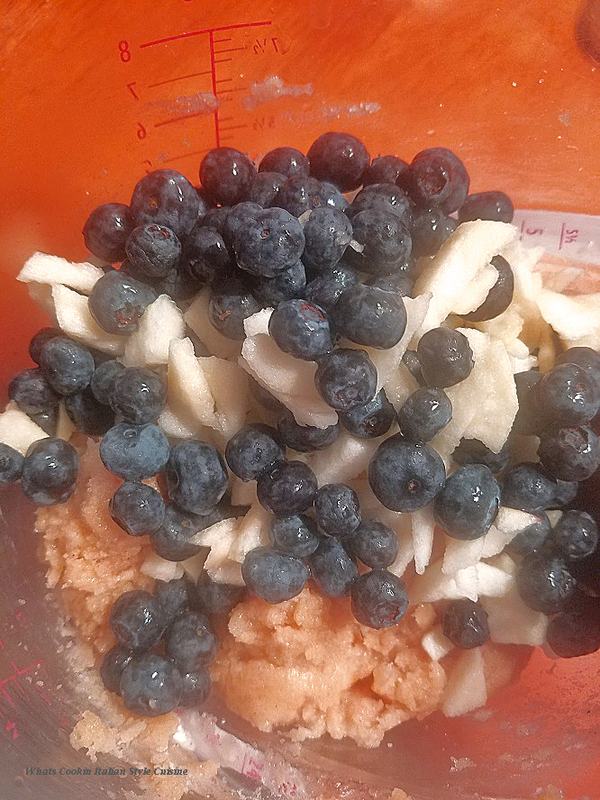 I love the combination of apples and blueberries plus the cinnamon makes this a favorite recipe! I really love muffins for breakfast. Add some delicious fruit and then cinnamon and I'm sold. These would even be perfect as a treat with some afternoon coffee. 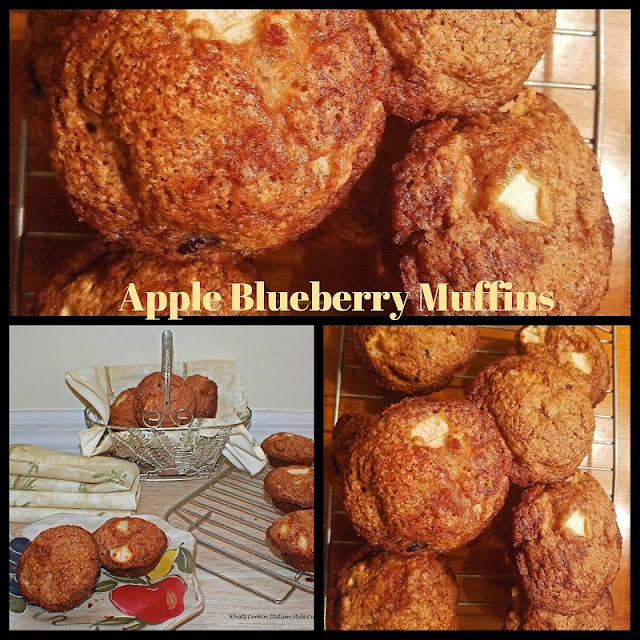 This is delicious and simple muffin recipe I never thought of a combo of apple and blueberry, I have done apple and cinnamon. this is one of best breakfast muffin I have seen.